The best dividend stock is not always the one with the higher yield. 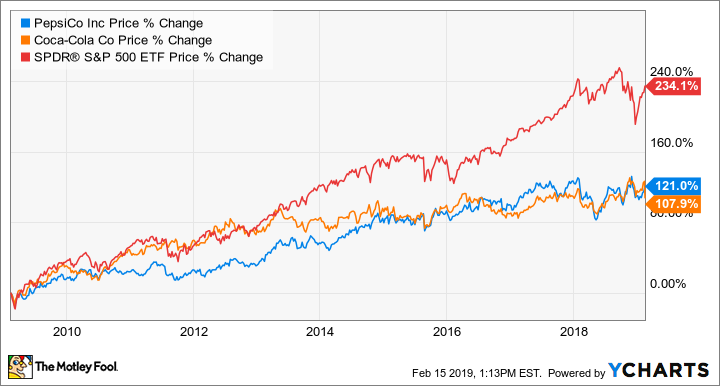 Both Coca-Cola (NYSE:KO) and PepsiCo (NASDAQ:PEP) are Dividend Aristocrats, meaning they have increased their dividends for at least the last 25 consecutive years. Coca-Cola has paid a quarterly dividend since 1920 and has raised the payout for 55 consecutive years. Its dividend yield is currently 3.4%, which is much better than the S&P 500's dividend yield of about 2%. On the other side, Pepsi has paid a quarterly dividend since 1965, the year Pepsi-Cola merged with Frito-Lay to create a beverage and snack food powerhouse. The company has increased its payout in each of the last 46 years, and its dividend currently yields 3.2%. Despite its slightly lower dividend yield, I believe that Pepsi is the better dividend stock. Here's why. A durable competitive moat is the essential ingredient of a great dividend stock. Without it, a company can run into challenges that make it difficult to deliver the consistency in operating performance that is required to support a rising dividend over time. Both Coca-Cola and PepsiCo have wide moats. In addition to their world-renowned brands, both companies have unrivaled distribution capabilities. Together, these two advantages allow Coke and Pepsi to control the lion's share of shelf space at stores, which makes Coke and Pepsi products stand out in store aisles. The only weakness of the two beverage giants is the consumer shift away from sugary soft drinks and snack foods. Both stocks have underperformed the market over the last decade as sales growth has slowed dramatically. PepsiCo and Coca-Cola vs. S&P 500 Stock Performance, data by YCharts. To deal with shifting consumer preferences, both companies have been diversifying into lower-calorie products. Coke is on a mission to become a "total beverage company." In addition to Coke-branded products, the company also owns Smartwater, Powerade, and several tea and juice brands. Also, Coke recently acquired U.K.-based Costa Coffee to expand into the $500 billion hot-beverage market. Pepsi has followed a similar path. The company has expanded beyond its core snack food products, such as Doritos and Cheetos, with better-for-you snacks that are marketed for their lower salt and sugar content. Pepsi has a broad portfolio of beverages and snacks, and the company just acquired SodaStream, the fast-growing do-it-yourself soft drink machine maker. Pepsi has been diversifying its beverage and food portfolio for years. In 2006, its Fun For You category, including soft drinks, Fritos, Doritos, Lays, and Tostitos, made up 62% of total sales. By 2017, Pepsi's revenue was split about 50/50 between Fun For You items and Good For You products. The latter category includes Aquafina water, Quaker Oats, and Naked Juice. These strategies seem to be working well for both companies. In 2018, Coke's organic revenue increased 5%, while Pepsi boosted organic revenue by 3.7%. Even better, Coke and Pepsi expanded their profit margins in 2018, thanks to both companies' constant focus on improving operating efficiency. However, Pepsi has managed to grow its free cash flow faster than Coke over the last 10 years. Pepsi's free cash flow has risen 47%, while Coke's improved by 19%. The snack giant has also been more effective at reducing its share count by repurchasing its stock. As a result, Pepsi has been able to raise its dividend faster than Coke over the last five years, as you can see in the chart below. PepsiCo vs. Coca-Cola Dividend Growth, data by YCharts. Growing free cash flow and steady dividend increases are two characteristics to consider when looking for a good dividend stock. But the payout ratio is the most important metric to evaluate, and it's this metric that makes Pepsi the better dividend stock. Over the last year, Coke paid out 111% of its free cash flow in dividends. A cash payout of more than 100% is unsustainable over the long term. Pepsi also paid out a high percentage of free cash flow in dividends, but not as high as Coke. In 2018, Pepsi paid out 80% of its free cash flow in dividends. Check out the latest Pepsi and Coca-Cola earnings call transcripts. Keep in mind, both companies are undergoing major restructuring efforts to improve performance. This is putting pressure on both companies' profitability in the short term. 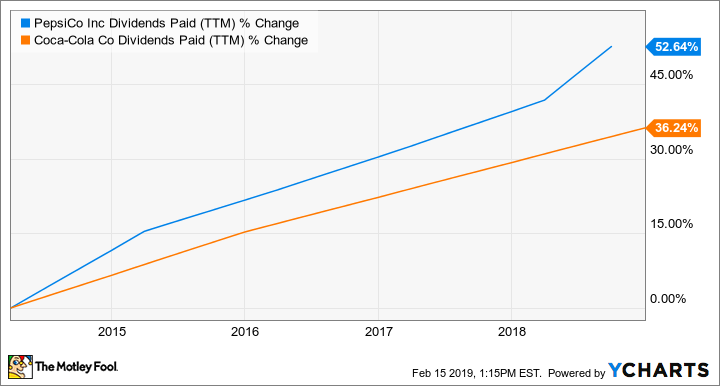 But even based on forward projections, Coke is expected to pay out more than 100% of its free cash flow through 2019, while Pepsi's guidance calls for a dividend payout of no more than 100% of its free cash flow. In addition to having a lower payout ratio, Pepsi has a lower valuation than Coke. Analysts expect Coke and Pepsi to grow earnings at approximately the same rate over the next five years: 6.6% per year for Coke and 6.4% per year for Pepsi. But shares of Coke trade for 20.4 times forward earnings, compared with 19.7 times forward earnings for Pepsi stock. Both Coke and Pepsi should be good dividend stocks over the long term, but I believe Pepsi is likely to increase its dividend at a faster rate in the foreseeable future. For this reason, income investors may want to consider skipping Coca-Cola and buying shares of PepsiCo.